Power Hour One: Update That Profile! Virtually every social media site or listing directory is strewn with incomplete profiles and barren social media accounts initiated by over enthusiastic users, then abandoned later. Moreover, now that many sites like Avvo, LinkedIn or Facebook have been around for more than a decade, profiles created back then may now be outdated or no longer conform to today’s standards. At the same time, as LinkedIn, Avvo and Facebook have grown, they’ve become saturated with advertising and the white noise of auto-links and useless responses to questions. So you may wonder whether it’s worthwhile to dive into this mosh pit, particularly if you don’t plan to spend any money. The answer is yes. For starters, just like the lottery, if you don’t play, you can’t win. In other words, if you don’t maintain a profile on sites where potential clients look for lawyers, you don’t have any chance at finding new business. What’s more, success stories still abound. Just last week, I met with a firm that had recently been certified as a women and minority owned business. Within hours of updating the firm profile and announcing the certification, the firm was contacted by a prospective client with an RFP. So if I’ve convinced you that taking an hour to upgrade your profile on LinkedIn or Avvo, or your law firm page on Facebook, here’s how to get started. Stick to One Site Per One Hour If you only have an hour, choose just one site to update. If you’ve never built out your profile, or haven’t updated in a year or more, you’ll need the full hour for a single site. Once it’s done, you can transfer or cross post information between sites. But if you try to update two or three sites at once, chances are you won’t finish any of them within 60 minutes. Choose the Right Site Which site to choose? If you have a consumer oriented practice, Avvo or Facebook are the best place to start, while LinkedIn is best for a business oriented practice.But there are other considerations as well. For example, on a site like Avvo, you can get an immediate benefit from updating a profile and increasing your score without doing much else thereafter. By contrast, if you decide to beef up your law firm’s Facebook page, you’ll want to have a plan in place for ongoing postings or the site will look like a wasteland in a matter of weeks. Assess What Needs to Be Done Take a look at your profile and prioritize what needs to be done. 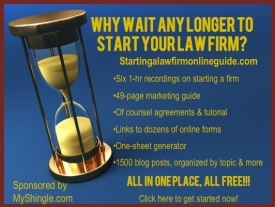 For Linkedin and Avvo, adding a profile photo or updating one from ten years ago ought to be top priority; for a Facebook law firm page, you may want to gussy up the banner or cover photo. Adding new accomplishments – certifications attained, a list of articles, awards and cases won – is also important. For Avvo, adding a couple of client testimonials (the subject of another PowerHour post) is critical; recommendations and endorsements don’t matter as much on LinkedIn or Facebook. On LinkedIn, taking advantage of the subject line and descriptive summary of your practice can up your appearance in searches. Increasing Avvo Ratings These guides by Majux.com and Jurisdigital will help you increase your Avvo rating. LinkedIn Profiles If your LinkedIn profile is skimpy or outdated, LinkedIn offers a comprehensive guide to updating your profile, as does this step-by-step guide at Yesware . Facebook Business Page Hootsuite offers this Guide to setting up a Facebook business page, and these tips from Neil Patel will let you pick and choose which parts of your page to maximize. Consider Outsourcing If it turns out that an hour isn’t enough time for you to make profile upgrades, it’s certainly enough time for you to outsource the task. You can find cheap, expert help on Fiverr – here’s a list of folks who can update your LinkedIn Profile , while these people can build a Facebook Business Page . Fiverr is so cheap that you really have nothing to lose by experimenting with outsourced help to set up your profile. Follow Up Once you’ve gotten your profile set up, tell the world! Post an update on LinkedIn or other social media sites to announce a higher Avvo rating or a new skill. And if you can, try to set aside an hour same time, next year just to make sure that your profile content stays fresh.